I’d heard it might be a possibility but didn't think much about it. Then, down it came: snow. In December. In the South. Snow in our area in any month is big news, but this early in the season, when it's not even winter yet—well, it’s unheard of. It was a Friday in December last year. My husband was working at home that day, and we decided to grab a quick lunch at our favorite pizza place. When we left the house, a light dusting of snow dotted the ground. As we sat in the booth at the restaurant, the flakes got bigger and more plentiful. By the time we left, the snow/icy mix was starting to stick to the road. 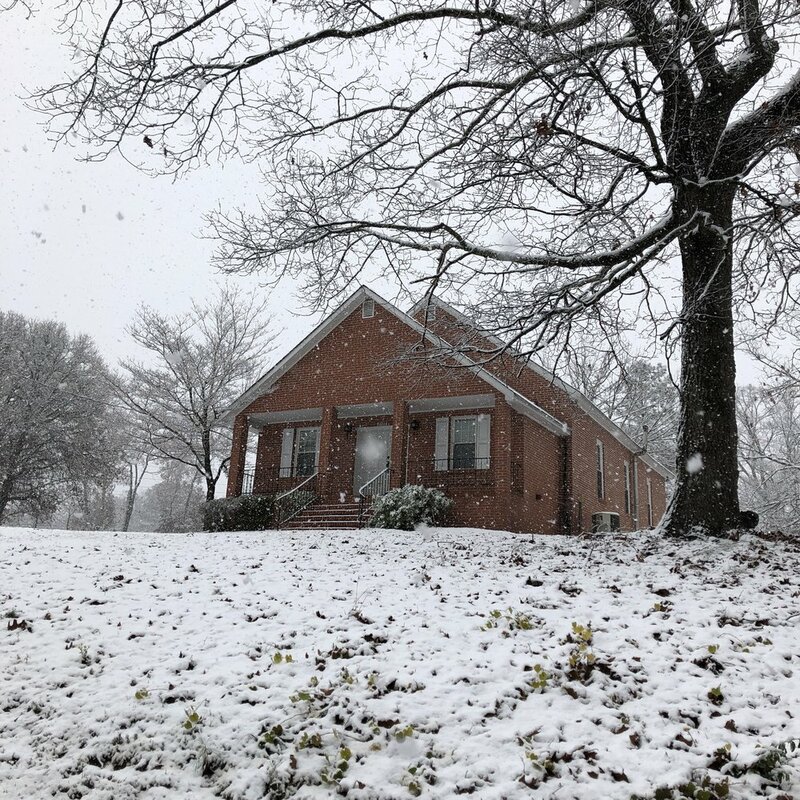 I love to watch snow fall—when it actually does fall—but a nagging thought grew in my mind: our daughter had to drive home in it. She’s a good driver, but she had had little experience in snow and ice. I was relieved that her school released students early in the afternoon. While I waited for her, I walked around our yard and took photos of the beauty before me. The leaves that I wrote about on a foggy Sunday morning a few weeks before were still on the trees. Here they are in the snow. I found other leaves too. 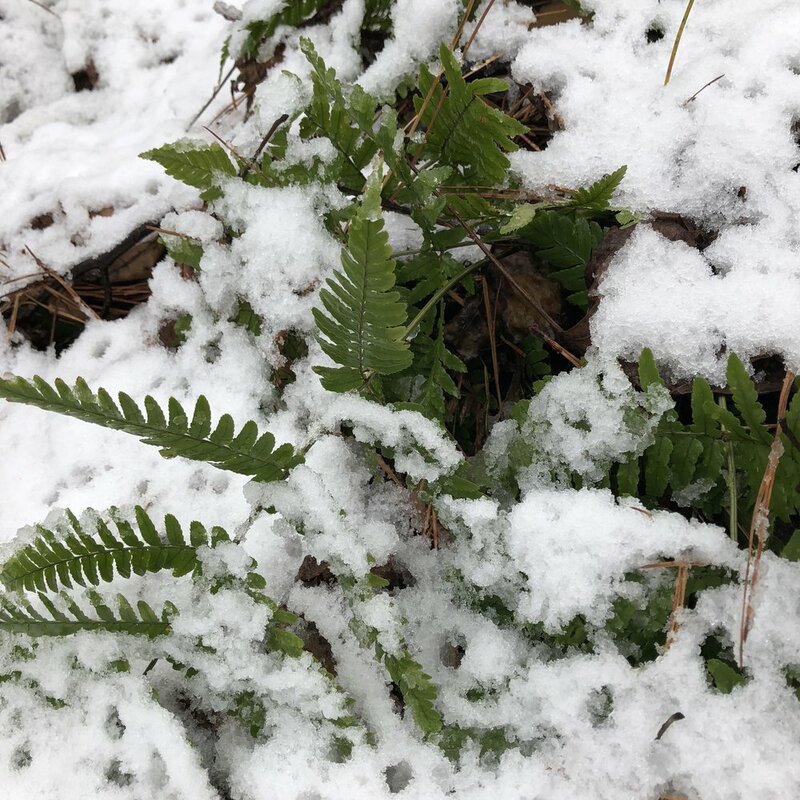 A fresh green fern looks out of season covered in snow. The dry creek bed now wet with snow. As I gathered dozens of photos, I thought back to a cold February afternoon many years ago. My daughter was a preschooler then, and I was a single mom. It was the first snowfall at our new place. I only had one roll of film--remember film?--and it was black and white, rather than color. I didn’t know if it would be provide enough contrast with the snow on the ground, but I loaded it into the camera anyway and bundled up from head to toe. I covered her in layers and topped her off with an Old Navy striped fleece hat, black coat with white leopard collar and cuffs, and multi-colored mittens. Out the door we went with our two Labradors. The dogs walked cautiously in the snow at first and then started running around, and so did she. It was about 11 degrees—not very many. I couldn’t wait to get back inside but still wanted her to have fun. We gathered a little pile of snow and dubbed it a snowman, or rather, snowdwarf. In the black and white photo below, the dwarf doesn’t even show up but that doesn't matter. It’s not the focus of the picture anyway. This is one of my favorite photos of all time. When I look at it, I remember two things: 1) She was a delight and a gift from God to me during my days as a single mother; and 2) a few days later, I went to the CS Lewis conference where I got to know a most interesting man, whose name was Mart Martin. She made it home just fine that Friday afternoon. And even though I was cold and wet, I had as much fun as a kid in the snow, taking pictures of the beauty around me. What's your favorite memory of snow? Do you like it? Let me know in the comments below. Thank you for stopping by my blog, Glimsen, where I write about the beauty around us in nature, the arts, and the unexpected. If you like what you've read, sign up to receive my weekly blog posts and occasional updates in your inbox, and I'll send you a gift of beauty. Just click on the big blue button below.